Learn more about the manufacturing technologies that early adopters are already using in their operations. "By incorporating advanced robotics, manufacturers may be presented with opportunity to reshape current business models and processes." 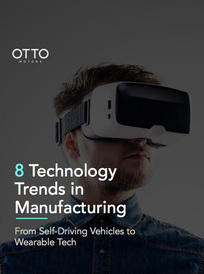 The 8 latest trends in manufacturing technology will enable new capabilities, giving competitive advantage to organizations throughout the manufacturing industry. 1. Which emerging technologies are poised to impact the manufacturing industry. 3. How these technologies are influencing the rise of industry 4.0.